I fly domestic first class a lot and it is rarely more than double the cost of an economy ticket. For example, for Thanksgiving my first class ticket is costing about $1200 where the economy tickets cost about $800. I am looking to book an international flight, however, and the cost for first class is WAY WAY higher than economy, almost prohibitively so (see graphic below). Why is the proportional cost for international first class so much higher? Your question is (I think): why does (US) domestic first class exceed the cost of economy by 50%, whereas international first class is many times the cost of economy. The answer to that is that the comparative services are vastly different. In (US) domestic first class you get a little more legroom, and a seat roughly 50% more wide. 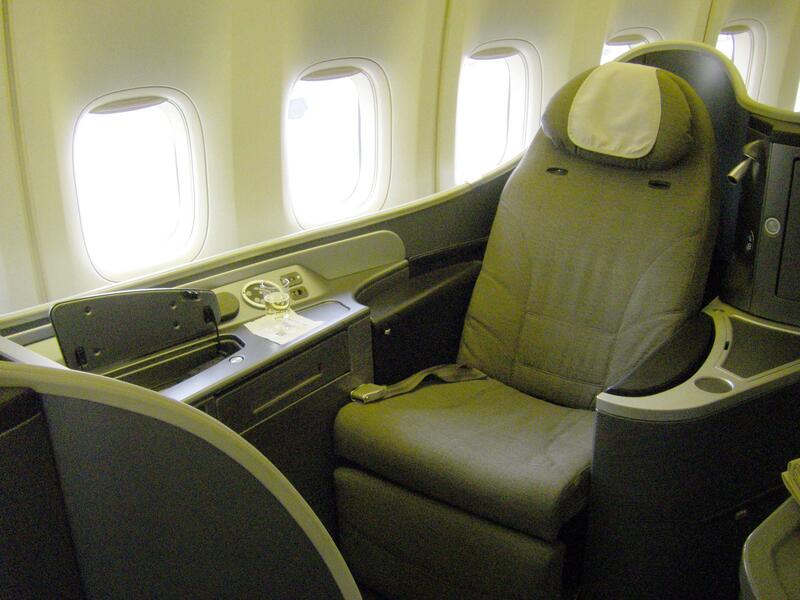 In international first class, you will often get far more than a fully reclining seat - a private bed is not unknown. Comparing the plane's floor-plate take is a crude measure, but it would not surprise me if a first class seat took 10 times the amount of space as an economy seat on an international flight. Look at the floor plans here (image not copied for copyright reasons) and you can see the six seats in the back half of the first class cabin of a 747 take about the same space as 4 rows (40 seats) of economy. Calculating very crudely, that would explain an approximately 7 times difference in price. Now look at a US domestic layout (here for example). You can see the 8 first class seats take only slightly more space than 12 economy seats. That would crudely explain a 50% difference in price. In terms of flying experience, there is a world of difference. LAX to NYC in first class is, well, slightly less uncomfortable than economy. However, NYC to LHR (roughly the same time) is luxurious in comparison. Personal opinion: if economy class between domestic and international are roughly the same, domestic first is significantly worse than international business (somewhere between international premium economy and international business), and international first is way out in front in terms of travelling experience (if you have money to spend / burn). On one of the two occasions I've flown transatlantic BA first class (sadly over ten years ago), I was given as an unprompted gift a 200 GBP (then about $350) bottle of claret, simply because I'd had a few glasses on board and seemed to quite like it, and they weren't particularly busy; I am told the experience is now far better. It's been pointed out that some carriers (e.g. AA) now offer certain domestic routes (LAX/SFO <-> JFK/EWR) with full reclining beds in first; however (as if to prove the point) these first class routes come at more of a premium than normal domestic first. International first (and business) class for long flights is a very different product than most domestic first class services. As you can see, the comfort and service are quite different. US domestic first class generally gives you a wider seat, a bit more legroom, no middle seats, free drinks, and snack and/or meal. (One significant exception being SFO/LAX-JFK/EWR routes, which some airlines operate as a much nicer flagship service with lie-flat seats similar to those used in international business class.) These are all fine things, but how much are you really going to pay for them on a flight lasting a few hours? In contrast, international first class is a much nicer experience. 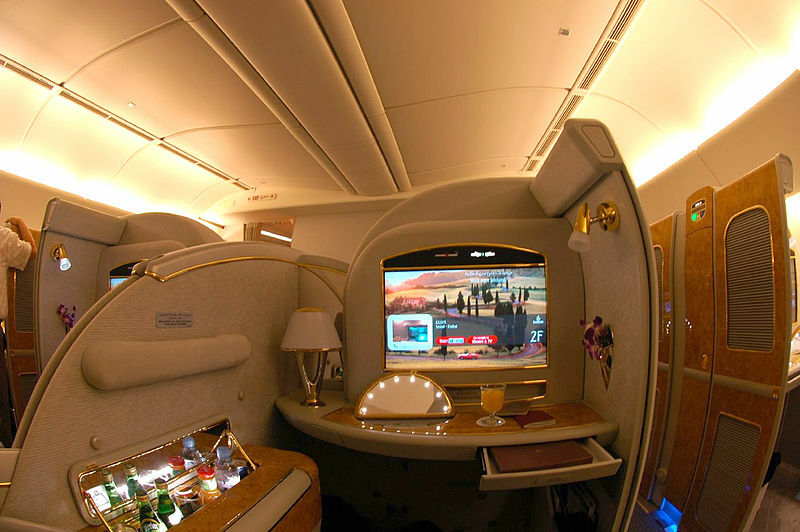 Amenities often include lie flat seats, bedding and duvets, fine foods like expensive champagnes and caviar, access to quality airport lounges, and even sometimes extras like pajamas, an on-board shower and bar/lounge (Emirates A380), and complimentary spa services at the airport lounge. As a comparison, United's domestic first seats offer 37-39" of legroom and a 20.5" width. United's GlobalFirst service (where it's still offered) offers 78" flat beds and a 22" width. At the most basic level, international first class takes up considerably more space on the plane. Now, in the case of your specific flight, there's an important clue in your screenshot: the word "refundable" under first class. While you might be buying a ticket in economy, business, or first classes, there are over a dozen "fare classes" that you're really buying. A super discounted economy ticket may be sold in O class, while the most expensive first class tickets will be sold in F class. Fare classes are different from, though related to, cabin classes, which describe whether you're sitting in first class or back in economy; there are usually many fare classes for each cabin. Every fare class within the same cabin all offer the same service on the plane, but the fare rules, especially around changes and refunds, will vary, and airlines will manage the supply of seats in various fare classes to maximize their profitability. You're booking this particular flight at the last minute, it leaves in four hours. That's unusual, and outside of a special last-minute fare sale offer, generally indicates a strong need to get to London immediately, perhaps for an important business meeting. The airline, based on its experience and knowledge of the market, how full the flight is, and other secret pricing strategies, believes it has at least some shot of getting someone to pay a $19,500 for a first class seat. Why? Because some people for whom money is no object do show up at the last minute wanting to fly first class. If one comes along, the airline will happily sell it at that price. If not, they can try to sell an upgrade to someone else who already has a ticket for cash or miles, or even let the seat fly empty. Either way, they're only willing to sell F-class fully refundable first class fares for this flight right now, and you will pay through the nose if you must have one. In your comments, you seem to indicate that there should be some kind of fixed ratio between economy and first class pricing, but that's not how it works. The airline adjusts prices to try to maximize their revenue. While the supply and demand curves for first class and economy class seats are related to each other (funny things start to happen if all you have left is full-fare economy and discounted first, and that does happen occasionally), they are still separate products and are priced separately. All of this may change for flights booked farther out in the future. Airlines can and do offer discounted first and business fares, usually targeting leisure travelers. These fares generally aren't fully refundable, but they might cost a fraction of that price. The short answer is "because they can". Airlines have very sophisticated revenue optimization programs that dynamically adapt the price of the day to supply and demand. Even in Business, there are multiple fare classes (J,Z,D) which offer the same seat at drastically different prices. Since this flight is very soon, they block all the cheap seats and wait for last minute customers that are desperate and rich enough to pay for this. If the seats don't sell, they will typically upgrade high status customers (which is an entire science by itself). There is also a significant difference in the "niceness" of the seats. International Business is significantly better than Domestic First, often with lie flat seats and little pods for seating. "International First" is simply for the few people for which money is no object whatsoever. This is currently evolving and many international flights don't have a First Class anymore. This being said, there are other options. A few new budget carriers have popped up and will probably upset the pricing if they gain traction. For instance, Norwegian offers Boston<->London for about $1500 in Premium Economy. That's actually significantly nicer than Domestic First but not as good as International Business and actually a really good option for this route. 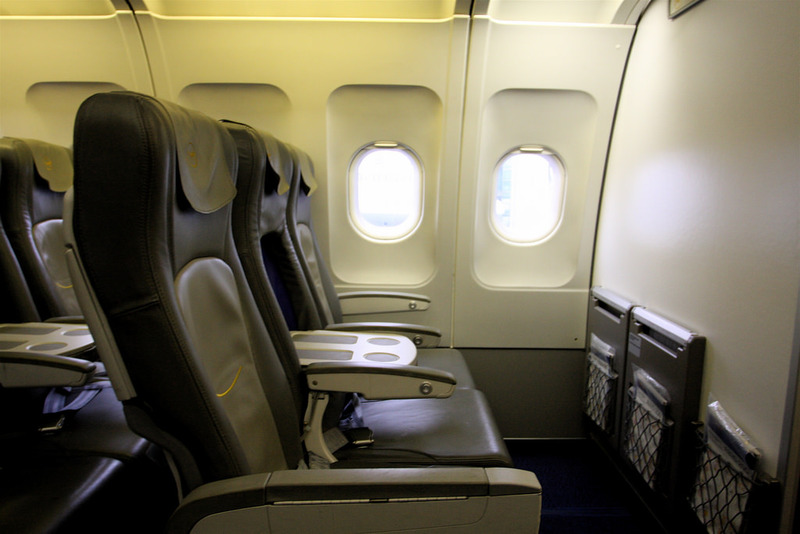 Many corporate policies allow upgraded seats only on trips of more than a certain number of hours. Boston to London is a 6.5 hour flight, and would certainly be one of those included. So the market of flyers who don't care much about the cost is much higher on such international flights, and they can charge more. Consider also that a business person arriving more rested in London may be able to accomplish her or his tasks a day or two earlier, and that can easily pay for the difference. Personally, I find the overnight flights (and most are) a killer in that direction and would rather pay a bit more to fly in economy during the day. In my (rather limited) experience, those flying first and even business class have rarely shelled out the full fare from their own pockets. As others have pointed out, the difference between first class on a crappy domestic fare and first on some international flights is night and day- the domestic ones may be just a bit more space and some extra attention- so what would be premium economy on an international flight, whereas something like first class on Hainan airlines to Beijing or Singapore Airlines or Emirates might allow you to lay down flat and sleep soundly during the long flight. For clarity, the cost is irrelevant. The various classes of service are priced that way because that's what the American Airlines (in lawful collusion with BA) decided it would be. Why do they price First Class 11x on this flight? Because they think they can sell a certain number of seats at that price, which may not be the entire cabin by the way. For a 7:20pm flight, 10 seats might be inventoried for corporate contracts that price at much less, but need to be available. Not the answer you're looking for? Browse other questions tagged air-travel budget international-travel luxury or ask your own question. 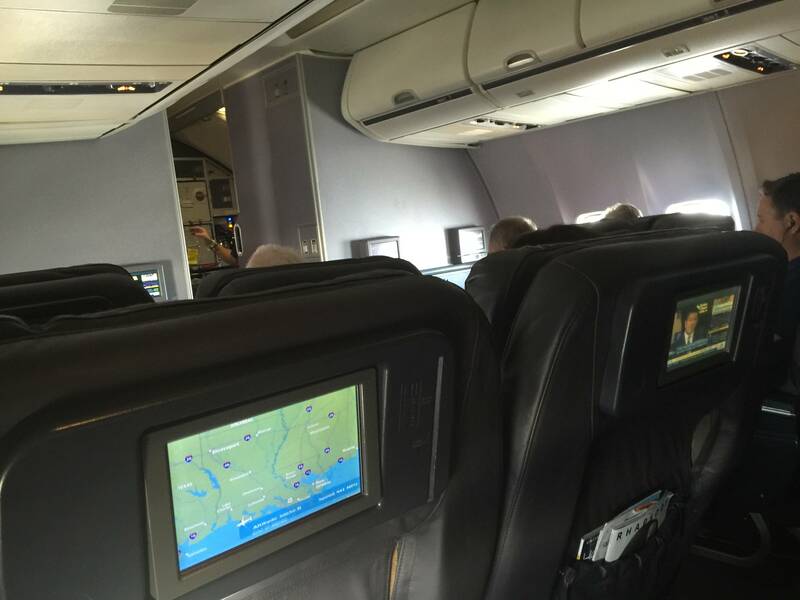 What does First class (fare class F) on Jetstar Airways mean? Are you allowed to swap seats with a friend in a different booking class?